Each time we drove through more and more figures started to appear. Some famous, some not so famous but every house or building in the village seemed to have one. 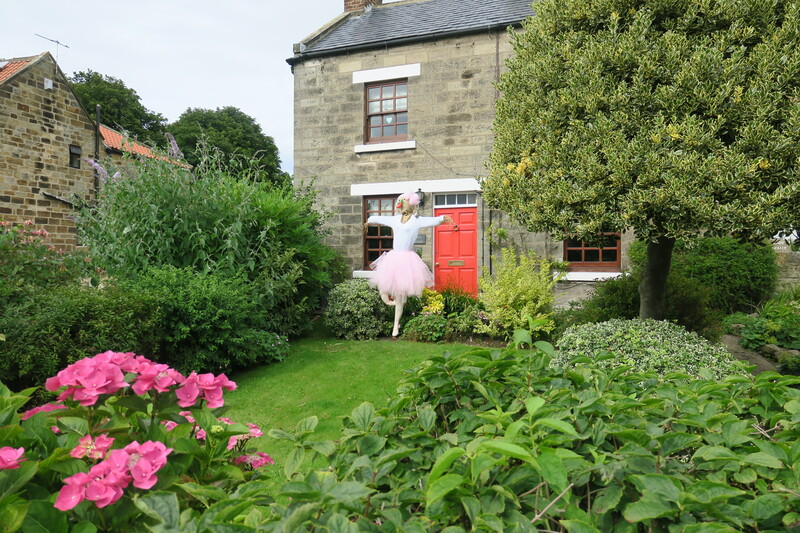 By the end of the week the Hinderwell Scarecrow Festival was in full swing. We had to stop, take a walk around and have a closer look. 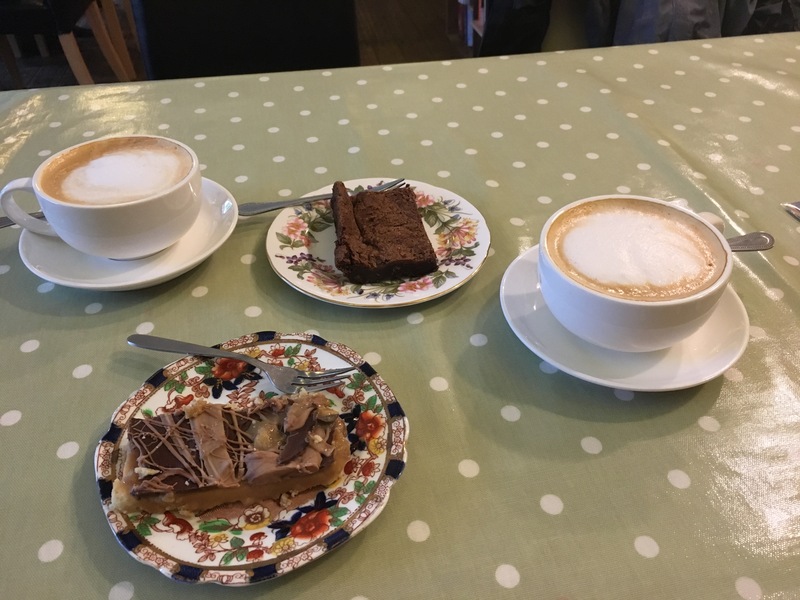 We paused for coffee and cakes in the most gorgeous little cafe – the Runcible Spoon – how could you not love a place with a name like that. 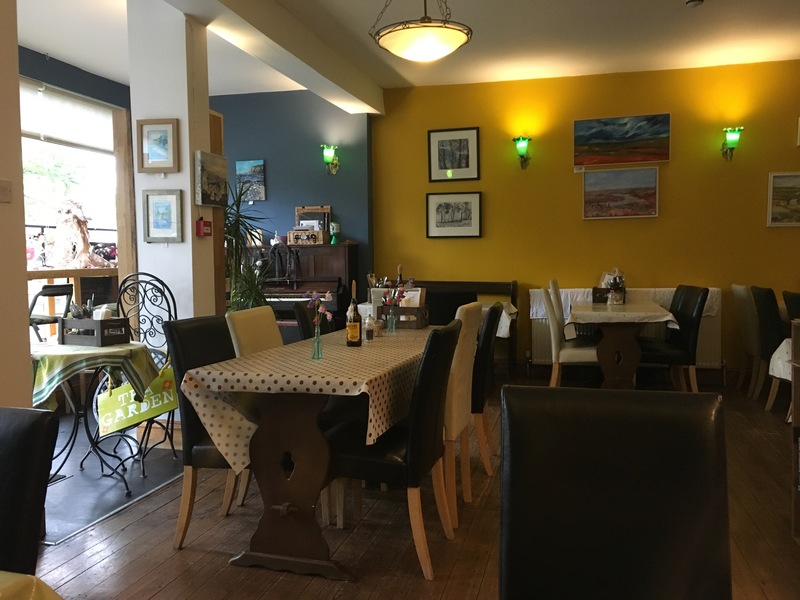 Quirky and eclectic inside, the staff were friendly, the coffee was good and the cakes were just divine. My chocolate brownie was up there with the best I’ve ever had and Husband’s caramel square was beyond delicious. 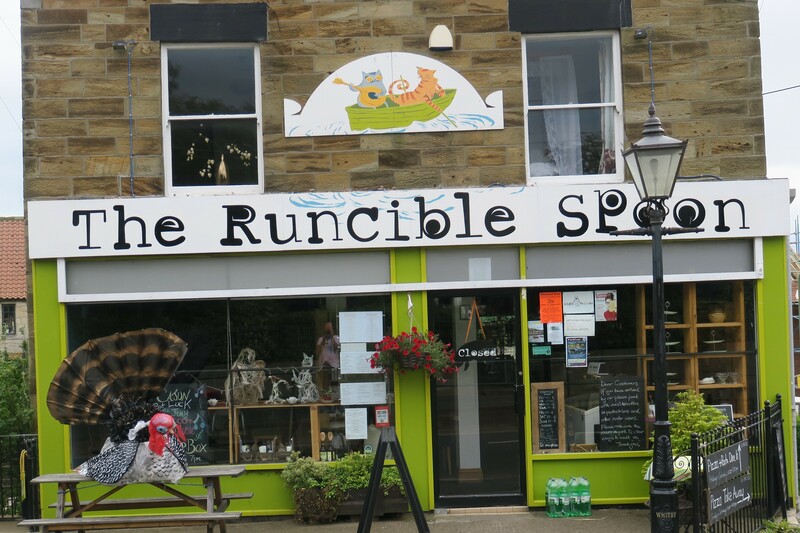 They had interesting cards and little craft items for sale too, if you ever pass through Hinderwell definitely stop here. 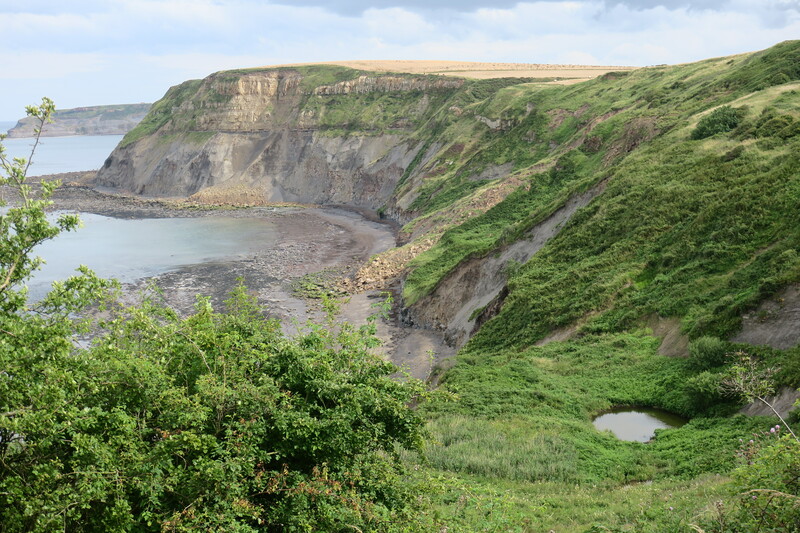 We decided to extend our walk a bit and check out Port Mulgrave. 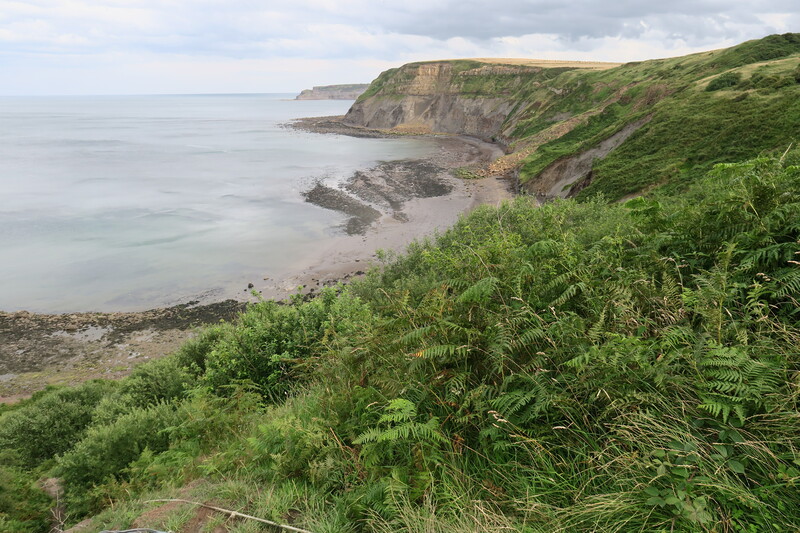 There is a coastal path from Staithes to this place, unfortunately we ran out of time to do what sounded like a superb hike, but this way we still got to experience some of the views. A sign saying the footpath was shut due to a landslip almost put me off until a local man walking his dog appeared and told us it was fine. 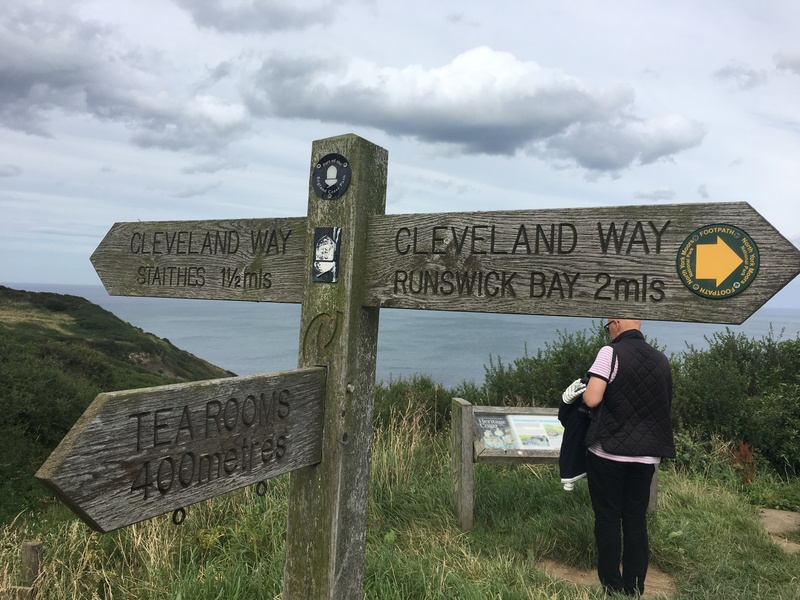 We walked halfway down – a super steep hill and having already hiked Hayburn Wyke and part of the Cinder Track that day I didn’t feel in need of any more hill climbing and managed to persuade Husband this was enough. We got a great view of the stunning Yorkshire coast and even managed to pick up a few fossils for Son – that counts as a good day. One of the things I love most about travel is happening upon such unexpected opportunities. Me too – quite often the unplanned things like this are the most memorable. It was a fun thing to see, we enjoyed how the whole village got into the spirit of it all. What a beautiful and adorable place!! It was such a fun day out! What a fun town to explore, I would have really wanted to look around all day just to find all the figures. 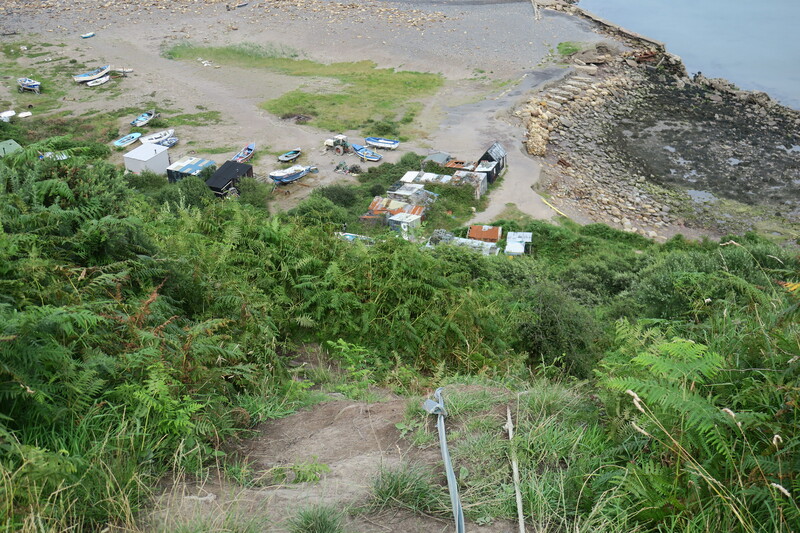 What a lovely coastal cliffside walk. The figures were so great, I love when a village does something like this, it must be such a lot of fun for everyone who lives there. We had fun exploring and looking at all their creations. The walk was gorgeous, the views were incredible, lush and green – all that rain earlier in our holiday must have contributed to that Terry! The coastline there is so beautiful Joy. I loved the scarecrows, the villagers must be very talented to create such amazing figures, there’s no way I could do it. 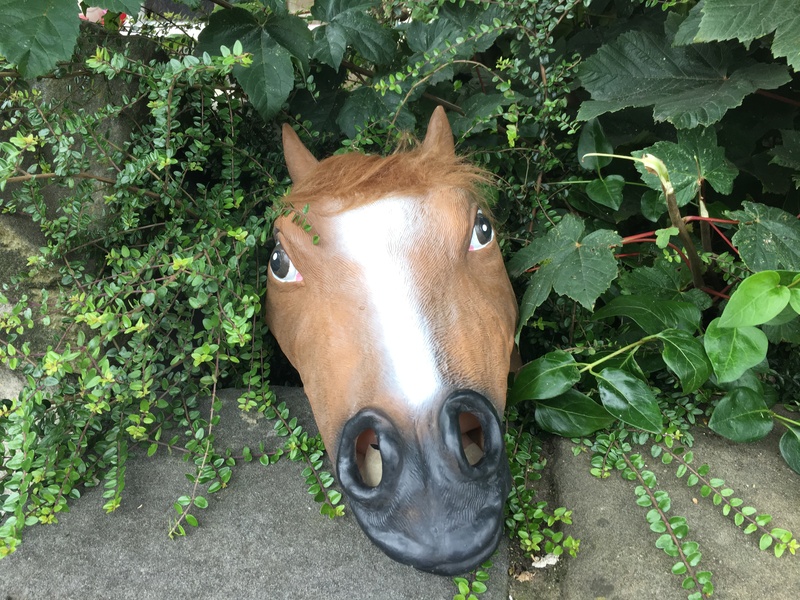 The neighbouring village to us also have an annual scarecrow festival in July but we have always been away when it’s taken place. Perhaps we’ll get to see it next year. The views from this little place over the sea were just stunning Marion – so lush and green as well (all that rain earlier in the week…). 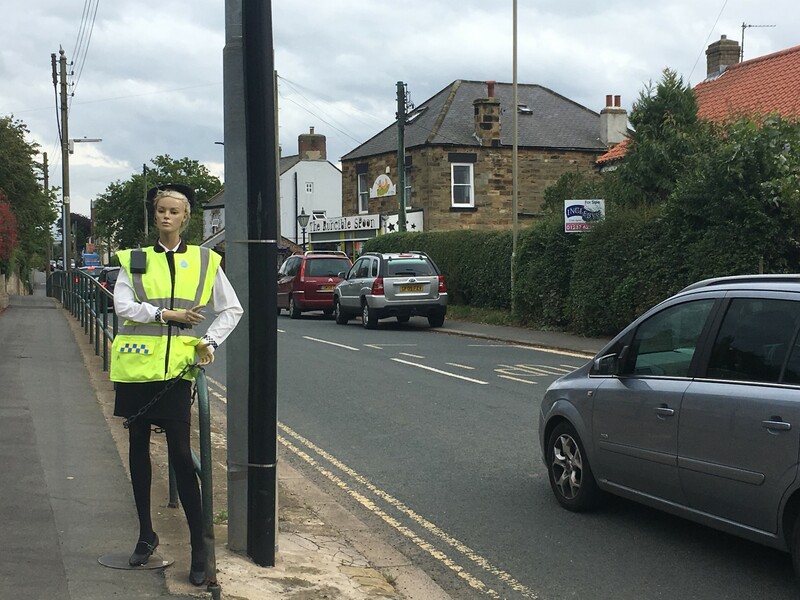 We loved the scarecrows, such a great idea to attract people passing through to stop for a while. They were raising money for the air ambulance so a doubly good thing. All of them were very well done, very clever too – I know what you mean though, it’s not something I would be any good at!! Pretty cool and creative little place, Joy. I love the scenery in addition to the scarecrows. I wonder if this changes year to year or if people use the same ones. 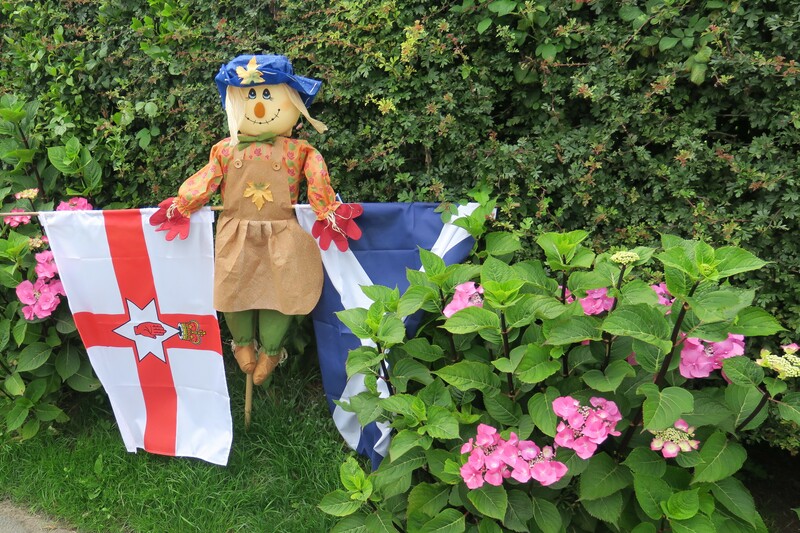 The coastal views just a stroll from the village are really spectacular George – the scarecrows were an additional bonus. I’m sure some of them must have been reused. Yay for surprise scarecrows! I love them, especially Spongebob! 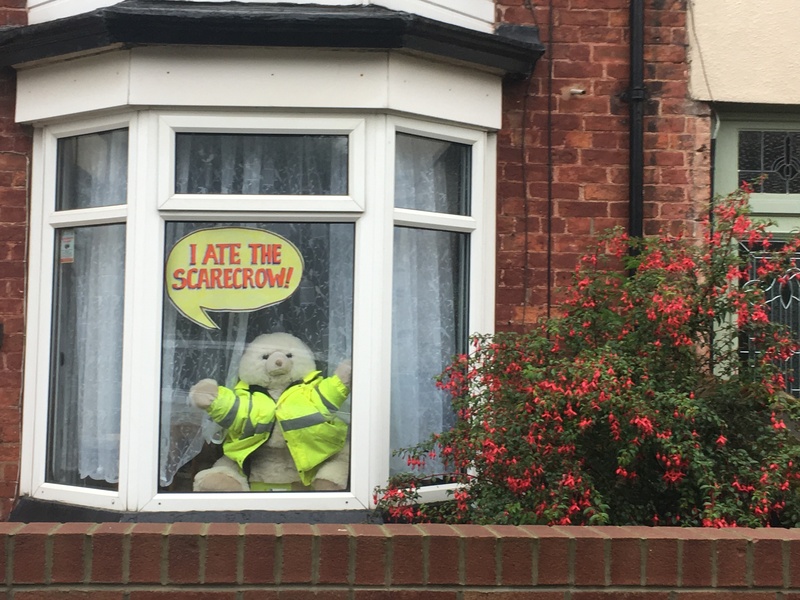 Weirdly, I vaguely remember visiting some village years ago that also had a scarecrow festival that I didn’t know about in advance. I’m not even 100% sure it was in Britain (it may have been in America) but I have been to Yorkshire a few times, and now I’m wondering if I was in that same village without realising it. If I’d had a blog at the time, then I guess I would know for sure! I loved Spongebob too!! Our son dressed up as Spongebob for something once so we have a bit of a soft spot for him. 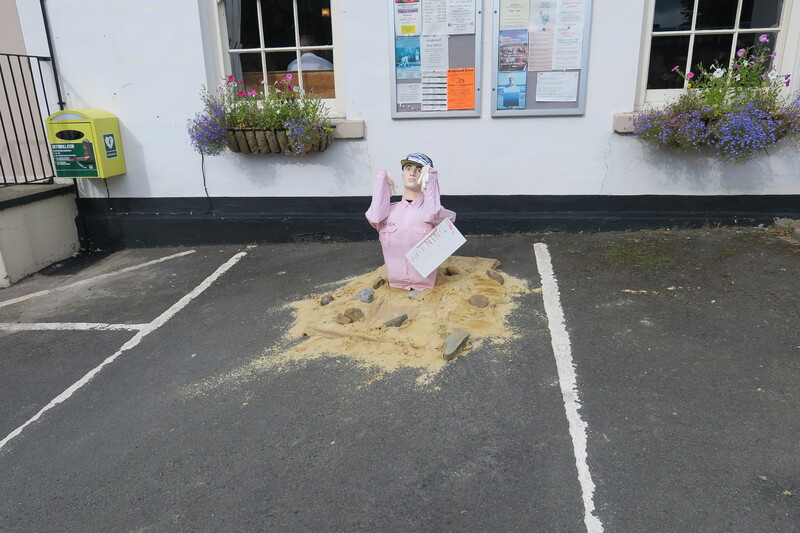 Someone else commented they had a bit of deja vu about the scarecrows and wondered if they had been to this village and seen them in the past…. maybe it was Yorkshire for you too Jessica!! I love Trump and his books. I can’t quite read the faded name but it looks to me as if the author of Diplomacy for Dummies is T. Blair, is it? The residents obviously don’t have much regard for our esteemed (cough, cough) politicians! I have a sense of deja vu here too, I wonder if someone else has blogged about it in previous years. Well spotted Anabel – it was T Blair. The little touches like that really made me smile here. It is an annual thing so I’m sure someone has blogged about it before. The Trump scarecrow is fantastic! We loved that one too!! 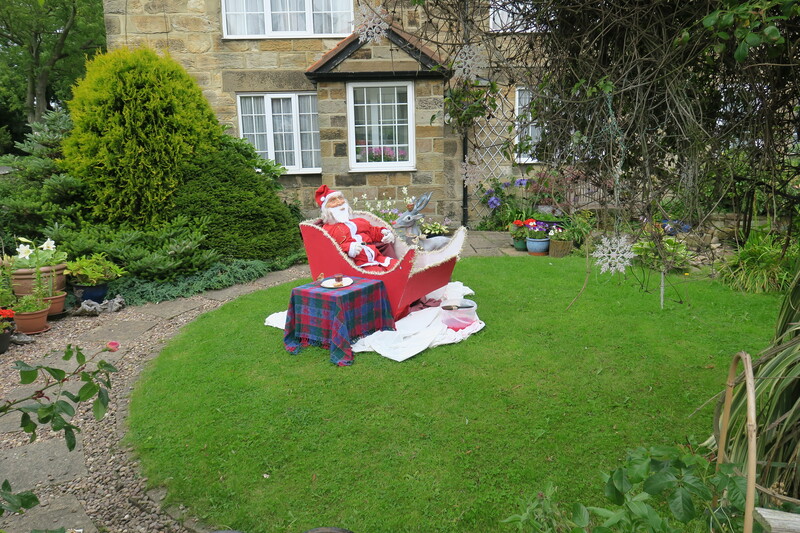 Now that is a fun little place…loved the scarecrows. The coffee and desserts look delicious! Oh they were so good Pam – completely delicious. Those scarecrows are brilliant – I love Scarecrow Trump’s folder on building walls!! Coastal path looks beautiful too. Your experience of the ‘footpath closed’ reminds me of a similar experience I had on holiday recently: footpath closed, but plenty of people on it! A bit disconcerting isn’t it when you read the sign but nobody pays any attention to it!! I was quite pleased about this one though, a good excuse not to hike all the way to the bottom (and then the top again!!). It does make you wonder at what point people actually heed the warning!! Probably when they see someone falling off the cliff!! Of course he “offered” me a taste of the cake (not really!!). Sometimes the towns that we race through turn out to be the best don’t they? Absolutely – they can often turn out to be real gems. Ha ha!! 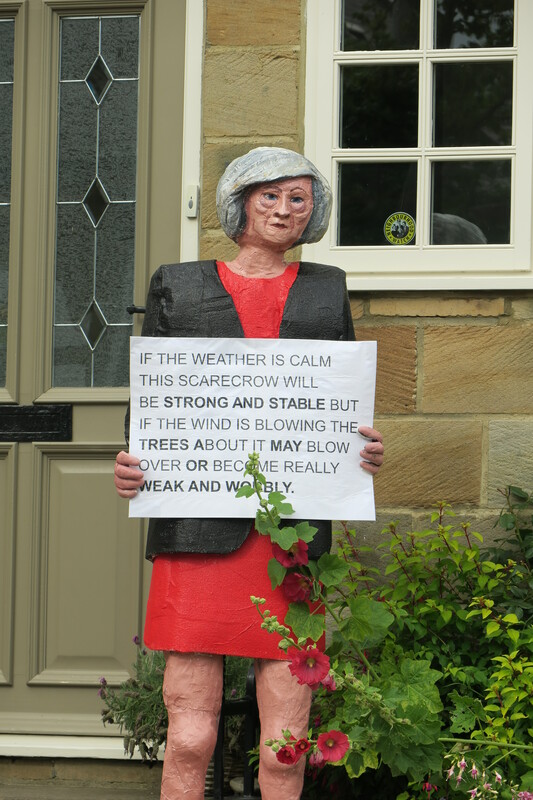 Some of the scarecrows were very topical!! What a lovely place! !The Trump scarecrow is incredible! We liked that one too – it was very clever!! 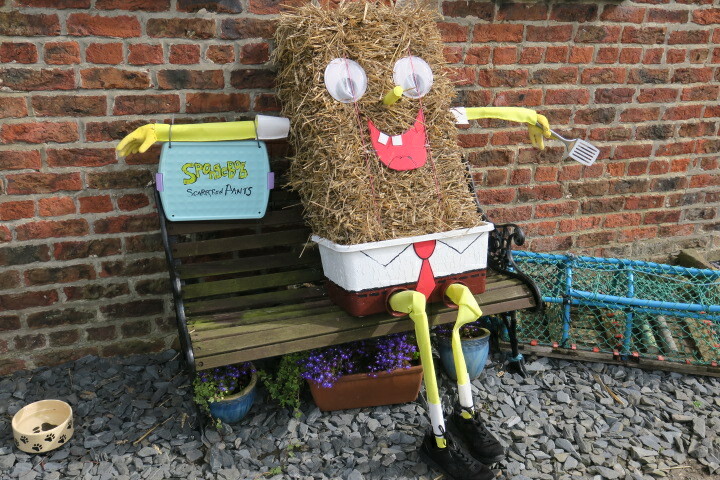 What fun to see the scarecrows. Desserts look delicious at the cafe. Scenery…very fine. Thanks for the share. Thank you for commenting!! 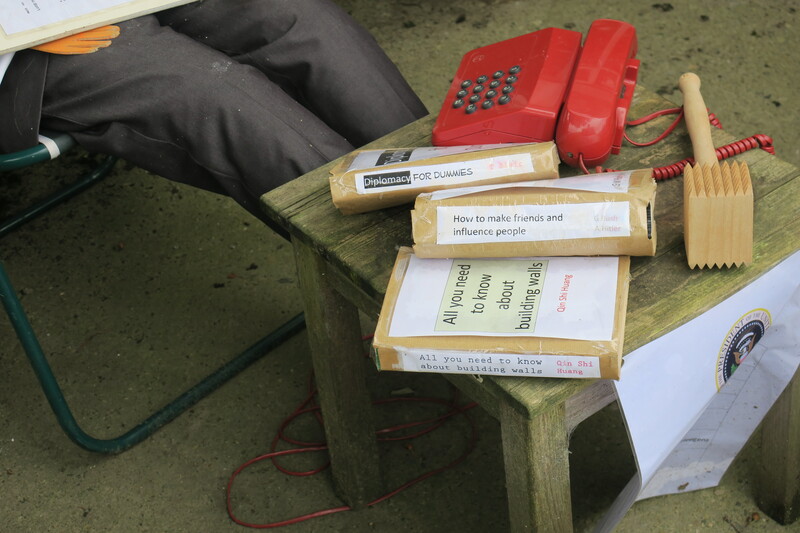 It was a really lovely afternoon – scarecrows, scenery and great cakes!! As Always thanks for showing me your country. Delightful. Thank you for coming along!! This is a wonderful house. This post is so amusing! I have never come across something like this before! Love scarecrow Trump, and the desserts look yum! Unplanned and mistaken travels sometimes make the best memories. 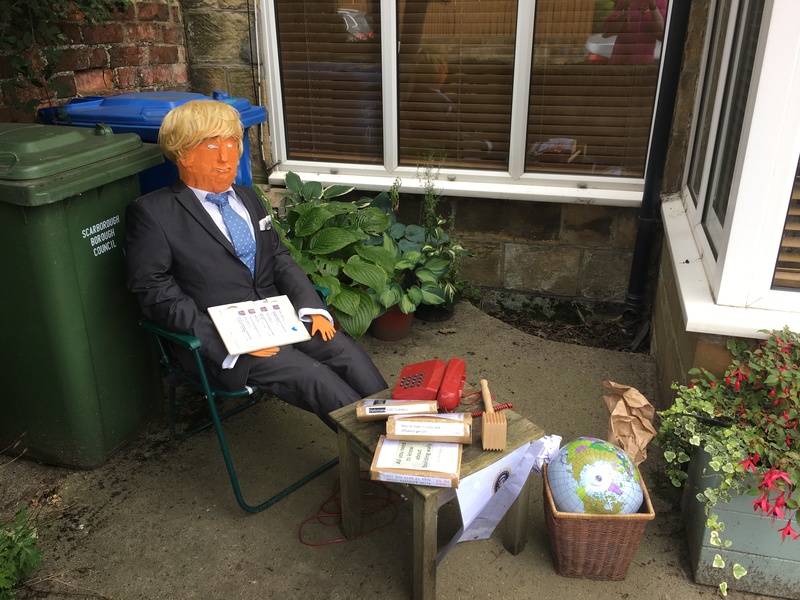 The scarecrows were so much fun and Trump was possibly our favourite. It was a lovely day out, totally agree, unplanned sometimes works out so well. I have just started a new blog on my travels too! Maybe you can give it a look! LOL on the scarecrows! We once remember one “guarding” a store when we went to a hike to Mt. Maculot in the Philippines. That sounds like an interesting guard!! Oh they look incredible – wish I had known about them when we were in Finland! !